Es tentador desestimar el ciberacoso como algo menos real que los métodos “tradicionales” de acecho. Sin embargo, los efectos sobre la víctima son absolutamente reales. Los efectos psicológicos son devastadores, produciendo trauma psicológico y daños declarados, independientemente de que la víctima nunca se encuentre en la vida real con su acosador. Los datos recogidos por la encuesta piloto ECHO confirman lo anterior, al indicar que las víctimas de ciberacoso sufren un grave Trastorno de Estrés Postraumático. The problem of stalking has probably been around since the earliest communities gathered. Newspaper reports and television news channels have reported for many years cases in which stalking ultimately led to a fatality or serious injury, especially in cases where one of the parties was famous, or indeed infamous. However these reports were not initiated due to the concern of stalking behaviour, but rather the act that it resulted in, generally involving violence. It is only relatively recently that legislation has been introduced in the United Kingdom to address stalking and harassment, with the introduction of the Protection from Harassment Act 1997. In America the first stalking legislation was passed in California in 1990, and by 1999 every other state and the District of Columbia had passed laws that criminalised stalking. Network for Surviving Stalking is internationally recognised as the leading Registered Charity in the United Kingdom dedicated to supporting victims of stalking, free of cost or commercial gain. It aims to provide support to victims, potential victims and others affected by stalking or harassment throughout the UK, to raise awareness of the subject and to provide information about stalking and harassment to professionals, relevant agencies and the public. As we have moved into an age of electronic information and communication, stalkers have found new, more effective and efficient means to perpetrate their malicious acts; stalkers have become Cyberstalkers. Cyberstalking has become somewhat of an epidemic stretching across the globe. Network for Surviving Stalking began to notice that an increasing number of people searching for support were being stalked or harassed online, making the charity concerned as to the prevalence, nature and impact of cyberstalking. The charity commissioned a team of researchers and together developed an online questionnaire to establish answers to these questions. This report provides an analysis of the responses to the questionnaire. Carsten is a Professor of Applicable Computing and the Pro Vice Chancellor for Research & Enterprise at the University of Bedfordshire. He is a Director of the National Centre for Cyberstalking Research and has published over 120 peer reviewed papers and is the author of the UK Security Breaches report supported by the Serious Organised Crime Agency and the Police Central e-crime Unit. He also works with advisors of the Equality and Human Rights Commission. He is an executive member of the Committee, and the Chair of the Information Group, of the Council of Professors and Heads of Computing (CPHC). He is also a Fellow of the British Computer Society, the Chartered Institute for IT and is a Chartered IT professional. Carsten has advised governments, agencies and banks around the world and holds two further professorships in China. Emma is a Chartered Psychologist at the University of Bedfordshire and is registered with the Health Professionals Council as Practitioner Psychologist in Health Psychology. She is a Director of the National Centre for Cyberstalking Research and initiated the ECHO project. Emma continues to speak at academic conferences and contribute to academic research in this area. She is also a coaching psychologist and works with individuals affected by bullying and harassment. Antony is a Lecturer in the Department of Computer Science and Technology at the University of Bedfordshire and a Research Fellow of National Centre for Cyberstalking Research. He gained his PhD in Statistical and Mathematical Modelling in 2008. Antony has published numerous articles in international peer-reviewed journals and conference proceedings. He has been involved in a number of projects funded through universities and national charities as well as an array of consultancy contracts. Stalking is an issue that has received increasing media coverage in recent years, but has been a problem for far longer than it has been considered newsworthy. There have been numerous cases reported in national and international press for many years, one of the most famous being the case of John Warnock Hinckley, Jnr., whose obsession with Jodie Foster resulted in him following US President Jimmy Carter across states in America, and ultimately in the attempted assassination of President Ronald Reagan. In response to similar concerns in Australia, Matthew Goode produced a report for the Australian Institute of Criminology entitled “Stalking: crime of the 90’s”, . In the UK, efforts to address the growing problem resulted in the introduction of new stalking legislation in the form of the Protection from Harassment Act 1997 . Though the act does not offer an exact definition of stalking or harassment, it “prohibits conduct that has a particular effect on the victim” . Prior to the introduction of the Act prosecutions had been made under various other items of legislation, where possible, such as the Malicious Communications Act 1998 , the Telecommunications Act 1984  (both summary only offences carrying a maximum sentence of six months imprisonment) or the Offences against the Person Act 1861  (an indictable offence carrying a maximum sentence of five years imprisonment). The mental effects of stalking can be significant and result in charges such as assault occasioning actual bodily harm contrary to section 47 of the Offences against the Person Act 1861 . This was the charge in the case of R v Constanza in 1996. The case went to the England and Wales Court of Appeal (Criminal Division) (http://www.bailii.org/ew/ cases/ EWCA/ Crim/ 1997/633.h tml) wh ich rejected the appeal and affirmed (among other details) that assault could be committed without it being necessary for the victim to see the potential perpetrator of the violence. The court also demonstrated that it was for the prosecution to prove that fear was in the victim’s mind, but necessary to show how it got there. There have been many surveys that describe a rise in the number of cases of stalking. A recent episode of Radio 5Live Investigates  explained that Crown Prosecution Service figures and shown that prosecutions under the Malicious Communications Act have were higher than ever recorded in 2009, increasing almost 300% in five years; between 2008-9 and 2009-10 there was a 7% increase in the number of offence charged under the Protection from Harassment Act 1997 that reached a first hearing in magistrate’s courts. However, one of the problems with considering statistics of reports or prosecutions under stalking laws such as the Protection from Harassment Act is that very often the report or charge is made regarding another offence rather than one of stalking, such as the case of R v Constanza. In a number of cases stalking can have fatal consequences . It has been reported that 76 % of women who were murdered by their current or former intimate partners were stalked by their attacker within 12 months of the murder. Similarly 85 % of women who were victims of attempted murder by current or former intimate partners were stalked within 12 months before the attempted murder. There are a number of definitions of stalking that exist, each differing slightly. define stalking as “a course of conduct directed at a specific person that involves repeated (two or more occasions) visual or physical proximity, nonconsensual communication, or verbal, written, or implied threats, or a combination thereof, that would cause a reasonable person fear.” It is interesting that the definition excludes most electronic forms of stalking as there is often a lack of visual or physical proximity in such cases. The definition used in the British Crime Survey 2009/10, see , is that stalking is “two or more incidents causing distress, fear or alarm of obscene/threatening unwanted letters or phone calls, waiting or loitering around home or workplace, following or watching, or interfering with or damaging personal property carried out by any person.” In parallel, the psychiatric literature has defined stalking as a course of conduct by which one person repeatedly inflicts on another unwanted intrusions to such an extent that the recipient fears for his or her safety . Whilst each source offers its own interpretation, repetition leading to fear is a recurring theme in any definition. Stalking and harassment are distinctive in law since the offending behaviour is said to occur only when the victim reports themselves to be distressed as a result of the behaviour of another whom they believe to be threatening. The victim’s perception of the offending behaviour and its effects are therefore pivotal in providing criteria on which to make a charge. The Protection from Harassment Act states that “a person must not pursue a course of conduct which amounts to harassment of another, and which he knows or ought to know amounts to harassment of the other” (Protection from Harassment Act 1997, Section 1) . 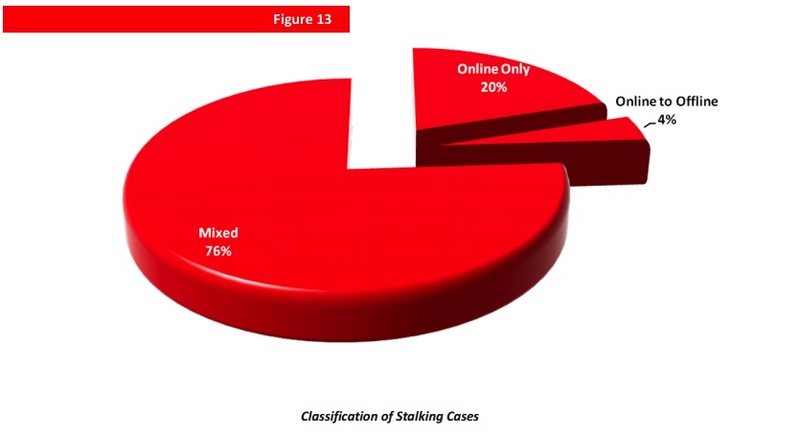 It is important to note that due to the subjectivity of the legal definition and the fact that there exist differing definitions regarding the number of incidents and the period over which these have been conducted, in this survey we did not define stalking for the respondents. Rather, we decided to ask about harassment and then investigate through further questions the frequency (to address repetition) and impact (to address fear). CTIA’s 2010 survey  reports that in 2005 there were 1,495 billion minutes of talk across the networks, 81 billion text messages, and 1 billion MMS messages; in 2010 the figures were 2,241 billion, 2,052 billion and 57 billion respectively. This represented only a 50% growth in talk minutes compared to 2433% increase in text message and 5600% growth in MMS messages. In 2005 the ratio of minutes of talk to text messages was 18.46:1, in 2010 the ratio was 1.09:1. The growth in these new modes of communication has greatly advanced society in areas such as community, education, health and commerce. However, with these benefits there have also been drawbacks. The amount of electronic data and communication has given opportunity for areas of society to act unethically, unlawfully or immorally. One area that has given rise to great concern, and is the subject of this work, is that of cyberstalking. Figures from the Crown Prosecution Service show that during the last year 33% of stalking incidents were by e-mail, 32% by text message and a further 8.4% were through social networking sites. Cyberharassment is the intimidation, repeated or otherwise, of one individual by another or a group perpetrated through or utilising electronic means. Cyberstalking is a course of action that involves more than one incident perpetrated through or utilising electronic means, that causes distress, fear or alarm. The nature and diversity of the impact of cyberstalking mirrors the variety of emotional responses that victims have reported for stalking. It is clear is that a significant number of victims’ reactions are of a negative nature and include fear, depression, stress, anxiety, lowered self-esteem, and a loss of trust in other people . This report presents an analysis of the findings of a six month pilot project established between the National Centre for Cyberstalking Research and Network for Surviving Stalking. The project involved the development of a survey that sought to examine the prevalence, motivations, nature and impact of cyberstalking, to provide new insights into the field and make proposals to address the problem. This report aims to communicate the diversity of the population who define themselves as having been cyberstalked and the particular trauma related thoughts and beliefs that victims have reported. Ultimately, this project will use the views of stalking victims to raise awareness of behaviours that can be classified as cyberberstalking and of the impact they have on those who are subject to them. The overarching aim of the ECHO project is to contribute to the emerging norms of behaviour and the meaning of behaviour in online environments. In addition we aim to more clearly define the “cyberstalking relationship”, namely to identify the specific communications technology-mediated actions performed by one party and directed at another, which may be interpreted as threatening, frightening, intrusive or otherwise unwelcome by that party; and also to identify the specific experiences of the 2nd party in response to the actions of the first party. The questionnaire was devised with reference to Sheridan’s original stalking questionnaire as well as an iterative process of communication with the Network for Surviving Stalking, technical advisors and researchers. The survey was designed to capture, demographic information, online behaviour and experiences of cyberstalking. Respondents were given text boxes to respond to with qualitative information about their experience, as well as questions using a Likert-type scale . The survey was conducted over 6 months between September 2010 and March 2011. During this period the responses of 353 participants were recorded with 68% of the 349 that declared their gender stating they were female. The survey was hosted on the website of Network for Surviving Stalking — people visiting the site being asked to complete the ECHO survey. Of the 353 self-selected participants, 324 stated that they considered that they had experienced some form of harassment through electronic communication. There may be a perception that stalking, or indeed cyberstalking, only affects certain types of people, or certain age groups, or a certain gender, but the results of the survey characteristics of participants will challenge any such notions. Of the 353 participants of the survey, there were 240 female respondents and 109 male respondents. This ratio of approximately 2 females to 1 male is much lower than a number of other studies concerning traditional forms of stalking. This is perhaps a consequence of the fact that physical stature, so often (though not necessarily) a factor in traditional stalking and intimidation, is irrelevant in the digital environment. Though the survey was anonymous, respondents were asked their age; 350 of the participants provided an age, though it should be noted the validity of the age submitted could not be verified. The age of participants in the survey ranged from 14 years old through to 74 years of age, and at both extremes had experienced cyberstalking. This wide spread of ages demonstrates that cyberstalking is not a problem that is peculiar to a particular age group.. 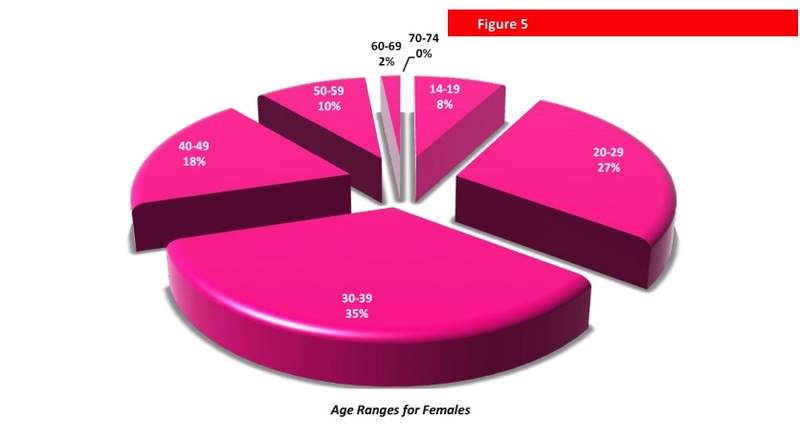 The wide age range was not biased towards male nor female – each gender had both teenage and pensioner respondents. The median age of respondents to the survey was 35 years of age, with both males and female respondents having similar median ages of 38 and 34 respectively. As can be seen in Figures 2 and 3 a significant number of respondents fell into the age bracket 30-39, approximately one-third of all those surveyed. 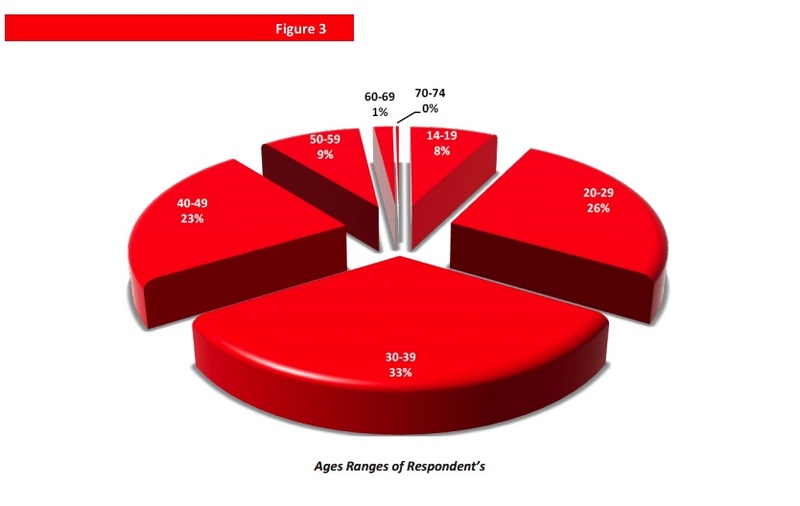 A similar proportion of respondents were in the 20-29 age range as were in the 40-49 age range, with approximately one quarter of all respondents in each category. These three categories comprised more than 80% of all respondents. The distribution of age ranges for each gender did show a difference. The largest category of males participating was the 40-49 age range, whereas for females it was the 30-39 age range. Each of these ranges comprised one third of all respondents for that gender. Of the respondents that felt they had experienced some form of harassment through electronic communication, 80.9% had felt fear. 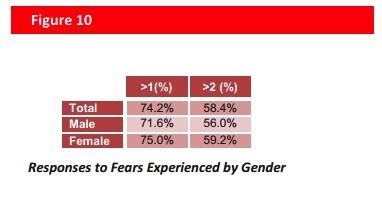 A greater proportion of females had felt fear than male respondents had, with 82.7% feeling fearful compared to 76.8%. Each of the respondents was also asked whether they had felt distress in their ordeal. The percentage experiencing distress was understandably higher, as anyone who had felt fear would feel distressed at the experience. Of all respondents 94.1% felt distress and the figures for males and females were 90.5% and 95.6% respectively. Cyberstalking can lead to a number of anxieties in the victim. Of course physical injury is one of the major concerns in traditional stalking, but this fear can also arise in cyberstalking, not least of all because cyberstalking can be accompanied by the more traditional forms of stalking. It is quite conceivable that a victim met the aggressor in a physical environment before the cyberstalking campaign commenced. Conversely it is possible that an online encounter could lead to a physical encounter. For these reasons a number of cyberstalking victims fear physical injury to themselves. Harassers, either online or physical attackers, are known in many cases to turn attention to the families, work colleagues or even pets of the original target. This gives rise to occasional fear of physical violence against significant others, and again females were more concerned about this than males. A somewhat surprising result on first impression was that 13% of respondents were afraid of injury to feelings. However, given the previously discussed mental impact that cyberstalking can have the result becomes more understandable. In all, females were significantly more likely to be concerned with injury than males. Whilst females were concerned about injury, males were significantly more concerned about damage to reputation and financial loss. The ubiquitous nature of the Internet and its increasing importance in modern business has led to the greatest concern for both males and females being related to damage to reputation. Almost half of the male respondents listed damage to reputation as their primary fear, and well over a quarter of females sharing the same anxiety. A far less significant concern was over financial loss, most likely due to the fact that it could be perceived that as long as the loss is not too large, this is most likely to be the more short-term impact. Whilst the figures were low, men were more than twice as likely to be concerned about such a loss. 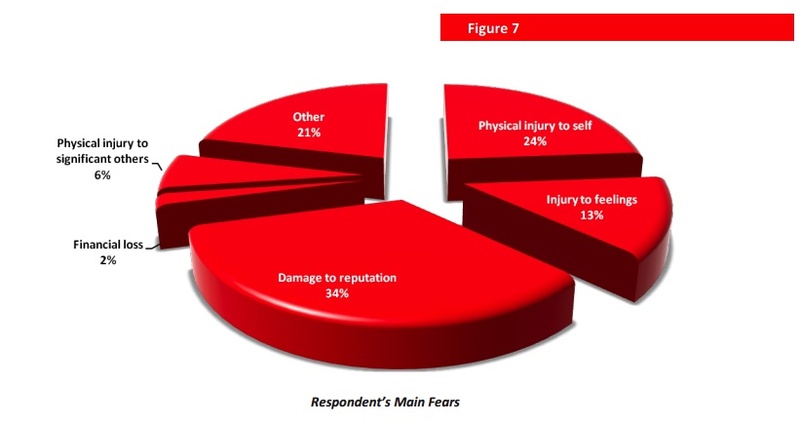 Respondents were asked to say what their primary fear was during the harassment behaviours, from a list given to them. The primary fears stated were damage to reputation and physical injury to self for the population, though males were far more likely to be more worried about damage to reputation. In addition to being asked what their primary fear was, respondents were also asked which particular types of harassment had caused them fear. Respondents were presented with 13 behaviours common to cyber stalking and asked whether they felt fear as a result of the behaviours. The results are presented in Figure 9; they indicate that the all the behaviours had caused fear. The activity that was reported by most to have caused fear was the compiling of information in order to harass or threaten (79.6%). Repeated emails and the posting of hostile material was also found to have caused fear by the majority of respondents. The other two behaviours that caused fear in more than half of the respondents was the adoption by one individual of multiple identities in their attempts to make contact and incitement of other into threatening behaviour by the harasser. There exist many possible electronic means by which an abuser can stalk a victim, including social networking sites, text messages and Internet forums. Males were more likely to be harassed using Instant messaging and work e-mail, females reported more harassment via mobile phone/texts. The growing use of electronic media, in various forms, has meant that those who are victimised may suffer through multiple channels. 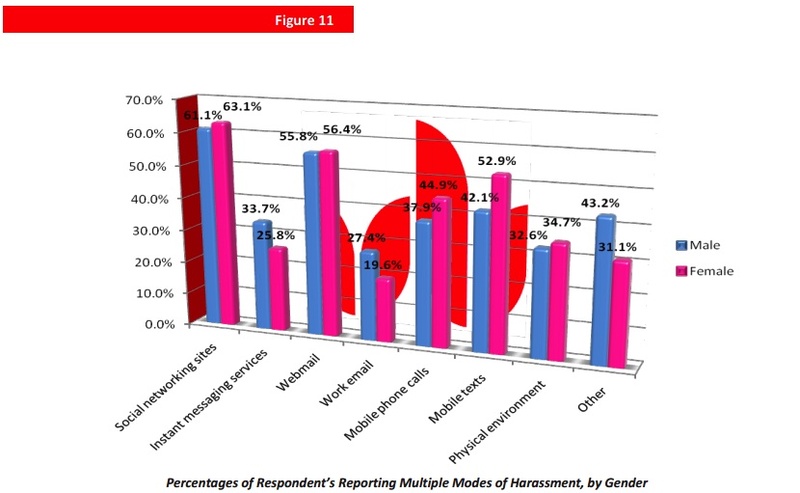 Figure 10 illustrates that the vast majority of participants (74.2%) reported that they were harassed in more than one environment, with over half being harassed in 3 or more different ways. One key question of interest is where respondents were first encountering their harassers. By ascertaining the answer to this question we can establish the level of transition of harassment between physical and electronic environments and develop effective preventions and interventions. Results show that the over half (54%) of the cases involved a first encounter in a real-world situations. Of those that meet harassers through electronic interaction, the most common arenas are social networking, internet forums or blogging sites. Interestingly, 20% report not knowing exactly how they first encountered their harasser. This is likely to be a result of the fact that identities in online environments can be easily masked and a victim may not be able to associate two online identities. 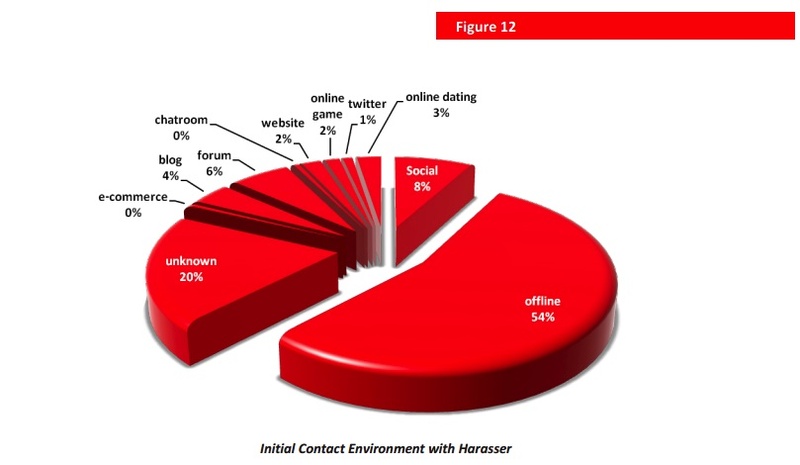 We can classify the reported cases into 3 categories: cases where the harasser was encountered online and the harassment stayed online (Online Only); cases where the harasser was first encountered online that turned into offline harassment (Online to Offline); and cases where the harasser was first encountered offline and turned into online harassment (Mixed). The majority of cases reported were ‘traditional’ harassment that utilised electronic methods but one in five cases were pure online harassment from start to finish. In comparison with a study by Sheridan and Grant (2007) the same three groups were identified, approximately 80.9% of cyber-harassment cases used online and offline methods throughout, 8.5% originated and remained online and 10.6% of stalkers originated online and crossed over to online stalking. This indicates that the ECHO pilot recorded a larger percentage of online only harassment compared to the previous study. Whilst it may be simply due to differing populations surveyed (The ECHO survey specifically asked about cyber-harassment whereas the work by Sheridan/Grant study included all forms of stalking), one reason for this might be that changing usages of the internet might be responsible, with increased usage, prevalence and reliance on social networking and online communities increasing the opportunity for online-only harassment. The survey established the relationship between the stalker and victim. 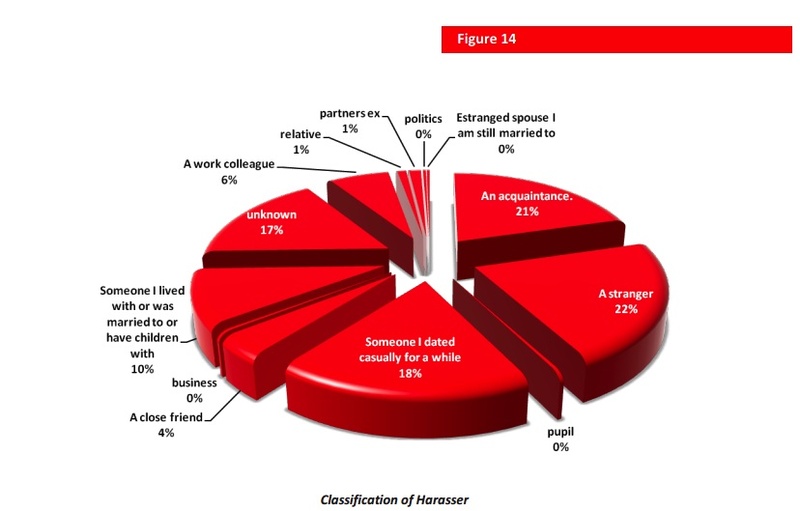 In 22% of the cases, the stalker was a complete stranger to the victim and in 21% merely an acquaintance. That is, in almost half of all cases there had been little or no prior relationship between harasser and victim when the stalking began. This is significantly higher than previous studies and in any consideration of traditional stalking. A great deal of this may be due to the existence and growth of online communities. The results also show that 18% of harassers are from casual relationships, where the harasser developed an obsession that has made it hard to release from the relationship. Only 40% of cases involved a close relationship that had gone awry. Figure 15 shows the relationship between victim and perpetrator broken down by gender. Interestingly the proportion of females that suffered cyberharassment from a person they dated casually, was one and half times that of the proportion of males that responded. Males, however, were almost twice as likely to be victimised by somebody from their workplace, a corollary perhaps of them being more likely to be harassed via work email. There was no significant gender bias for the number of people suffering cyberharassment by a stranger. The consequences of cyberstalking are clearly, as evidenced throughout this report, widespread and multilayered, affecting psychological, social and economic aspects of life. The ECHO pilot survey focussed attention on a range of consequences concerning changes to relationships, occupational activities and financial impacts. It is well documented that there is becoming a blurring of the boundary between personal and professional lives. The pervasive nature of electronic communications has led social networking, email, professional networking and mobile communications to be methods by which a great deal of people can contact us a great deal of the time. Clearly this will increased impact of communications technology has the potential to be a great disruptor when communications are not operated in what we consider to be the right manner. The survey asked participants whether the harassment had actually caused a change in their lives in work, personal relationships or financially. 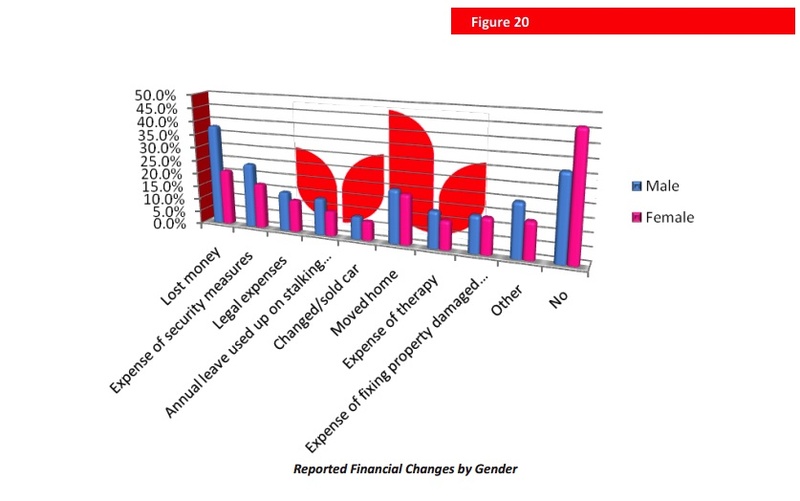 The majority of respondents experienced some changes to their life that they attributed to the harassment. Nearly 9 out of 10 individuals were affected in this way. Somewhat surprisingly, females seemed more resilient in this manner as more than twice as many of them , proportionately, reported no change in their lives. In terms of their working lives, males were both more likely to experience changes to their working lives and also to experience more severe changes such as having their employment terminated or demoted. Reduced performance at work was also a consequence of cyberstalking with almost a third of respondents reporting that their work performance or studies had been adversely affected by the harassment. In total 73% of people reporting negative changes to their working lives. Of all respondents, 4% of stated that they had been demoted or had their employment terminated as a result of cyberstsalking. The majority of respondents had experienced difficulties related to their employment, with 80% of men and 71% of women suffering. The adverse effects experienced appeared to have similar rates for men and women. However, a larger number of men reported losing their employment or being demoted as a result of cyberstalking and as having other not classified adverse effects on their working lives. There were slight differences in reporting of adverse effect on performance at work and the reduction of working hours with a greater number women reporting these impacts. Females, on the whole were one and a half times more likely to be unaffected in their work life as a result of cyberstalking. The impact of cyberstalking on relationships social activities was reported by the majority of respondents. Overall a greater number of men reported negative changes to their relationships than women. Men in particular were more likely to experience changes such as the giving up of social activities and the breakup of central relationships. However losing touch with family members and friends was more often reported to be an effect of cyberstalking by women. 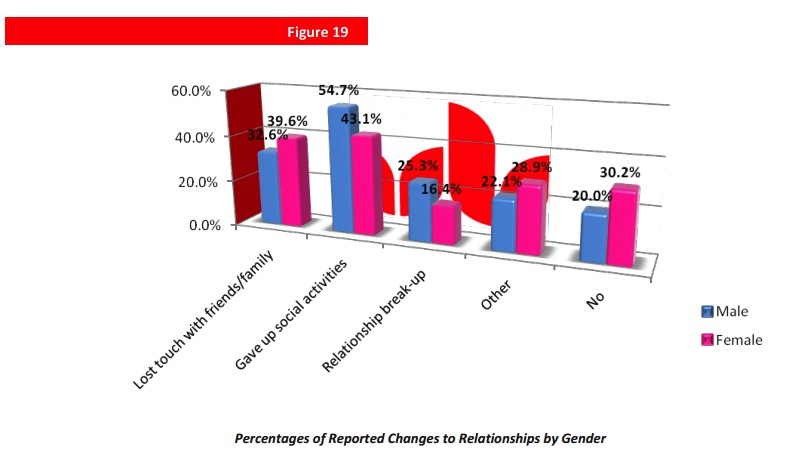 Women also reported a higher degree of other changes in relationships that were not covered by the survey questions. Results of the survey indicated that over half of the respondents were financially affected by cyberstalking. Overall, 70% of men reported some negative financial change as a result of cyberstalking. This was a greater proportion than of women, of whom 55% had experienced a negative financial impact. Nearly a quarter of responses had encountered the expense, and upheaval of moving home and a similar number had paid for additional security measures. The greatest difference between men and women reporting adverse financial changes caused by cyberstalking was the higher reporting by men of the direct loss of money as a consequence. For a charge to be brought under the Protection from Harassment Act 1997 , it is necessary for the victim to report the experience of fear or distress to have been caused by the actions of the perpetrator. Therefore, in order to define respondents as having been harassed in legally-recognised terms, we have attempted to measure and report the psychological impact. In general, this information can be measured by eliciting a self-reported level of fear or with standardised measures designed to identify general anxiety or a more specific diagnosis linked to the experience of trauma. The concept of trauma generally includes two criteria: a dangerous experience that exposes people to physical threat; and it pierces strong psychological defences to produce a state of fear, helplessness or horror. 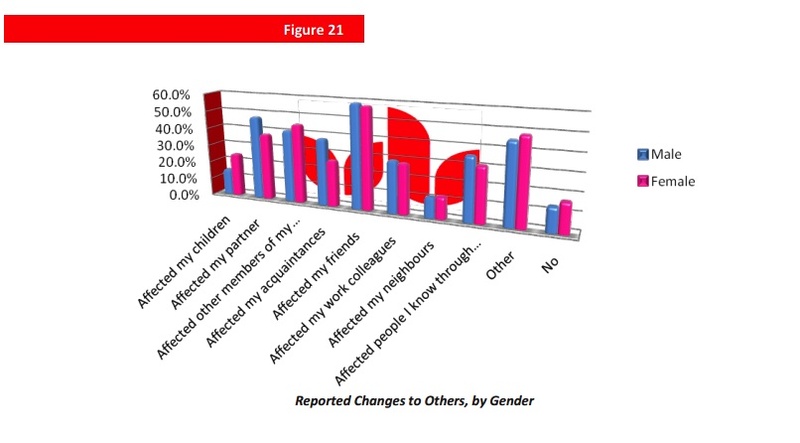 Respondents were asked whether the harassment had affected other people in their lives adversely. The vast majority named at least one category of secondary victim. Those most affected were friends, partners and family. It is usual for people to experience an acute phase of anxiety following trauma, however a number of people involved in traumatic events can go on to develop severe and prolonged psychological distress. Post-Traumatic Stress Disorder (PTSD)  is thought to affect 5-10% of the population following trauma, however the incidence varies following exposure to specific events. The diagnosis of PTSD rests on criteria derived from the Diagnostic and Statistical Manual of Mental Disorders DSM-IV. Sufferers re-experience events, often in the form of involuntary intrusions triggered by apparently neutral stimuli, as well as disturbing memories. Other symptom clusters are the experiencing of avoidance and numbing, often linked to withdrawal or dependence behaviours such as alcohol or drug misuse. The third set of symptoms relate to hyper-arousal. This may manifest in physical symptoms such as insomnia, irritability, poor concentration, hyper-vigilance as well as headaches, muscle aches and pains, nausea and increased startle responses. The ECHO survey collected information on levels of general distress as well as using tools to screen for symptoms of Post-Traumatic Stress disorder and associated thoughts and cognitions. The GAD 7, , consists of 7 items measuring generalised anxiety disorder. The tool has been described as a valid and efficient tool to screen for anxiety and to assess its severity in clinical practice and research. The Post-traumatic Cognitions Inventory (PCTI),  was used to measure trauma-related thoughts and beliefs suggested to underlie post-traumatic psychopathology. It consists of 36 items and three dimensions: negative cognitions about the world, negative cognitions about the self and self-blame. Symptoms of PTSD were measured using the PTSD Checklist, Civilian version (PCL-C), . The results indicate that the prevalence of PTSD following cyberstalking exceeds the occurrence in a general population following trauma and is comparable to other extreme specific traumatic events such as sexual assault and combat. Nevertheless, what is clear is that the victims’ reactions are of a negative nature and include fear, stress, anxiety, as well as an erosion of trust in the self and other people. The GAD7 classification of anxiety was used to measure how anxious the stalking experience had made participants feel. As can be seen in Figure 22, more than one third of respondents suffered severe levels of anxiety. Interestingly, given the differences in some of the earlier results, there was no significant difference in the percentage of males to females. Almost 9 out of 10 people experiencing cyberstalking suffered some level of anxiety. It can be seen that individuals who appeared to have symptomatic PTSD also exhibited more negative cognitions about themselves, and the world, and were likely to blame themselves for negative experiences or the trauma. In summary, 34.9% of respondents who reported experiencing harassment showed all symptoms of PTSD according to the clinical questionnaire. 68.9% reported at least one symptom of PTSD. Individuals that had experienced a combination of stalking (online and physical) had significantly higher scores of PTSD symptoms with close to 50% of respondents who experienced both offline stalking and cyberstalking indicated symptoms of PTSD. Those respondents who are classified PTSD Symptomatic score significantly higher in all of the other measures of stress/fear/impact on the survey. This helps validate that the PTSD diagnosis indicates actual heightened distress and emotional impact on the sufferer by using the other scales as a metric. Those Respondents who reported fear of physical confrontation have significantly higher scores in all of the PTCI scales apart from Blame, and all of the PTSD scales apart from D. This indicates that fear of physical confrontation is associated with increased psychological and emotional trauma. Those Respondents who reported actual physical confrontation have significantly higher scores in all of the PTCI scales apart from Blame, and in the PTSD Subscale B. Again, this indicates that the cases that experienced face-to-face, physical harassment of some form also generally experienced higher psychological trauma when compared to harassment that was ‘just’ online. In terms of fear, one interesting result regards those who suffered fear of face harassment compared to those who feared it but did not experience it (38.6% feared it but did not experience it). When we compare the Psychological scores (GAD7, PTSD, PTCI), we find that there is no significant difference in the scores between those who experienced face to face harassment and those who only feared it. This seems to suggest that the threat/fear of physical confrontation can have a similar psychological impact as actual confrontation can. The cases where the respondent had been harassed in more than 2 environments experienced significantly higher mental distress and fear than those who did not. Also, those categorised as being PTSD symptomatic have, on average, reported a higher number of methods through which they have been harassed. This indicates a link between the severity of the trauma caused and the comprehensiveness of the harassment. The more avenues that that the harasser uses, the more damage (in psychological terms) the harassment is likely to do to the victim. This can either be seen as an indication that more the more intense and destructive the desires of harasser, the more means of harassment are used to ensure they achieve their goals. It may be that the more ubiquitous the harassment, the less opportunity the victim has to escape and the more inescapable their harasser seems. This could have the effect of magnifying the distress caused by the behaviours. 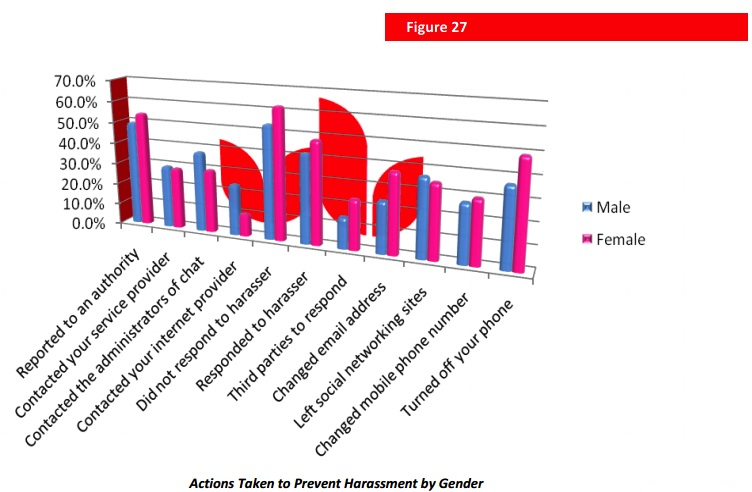 Respondents reported taking a very varied set of actions to try and prevent the harassment behaviours. The most popular were trying to ignore the harasser, reporting the behaviour to some authority or responding/confronting the harasser. In terms of gender differences, the only significant result was that males were more likely to report the behaviour to their internet provider (24.2% compared to 10.7% for females). Age seems to play a factor in behaviour, with people under 30 more likely to report harassment to authority, service provider or chat room administrators. 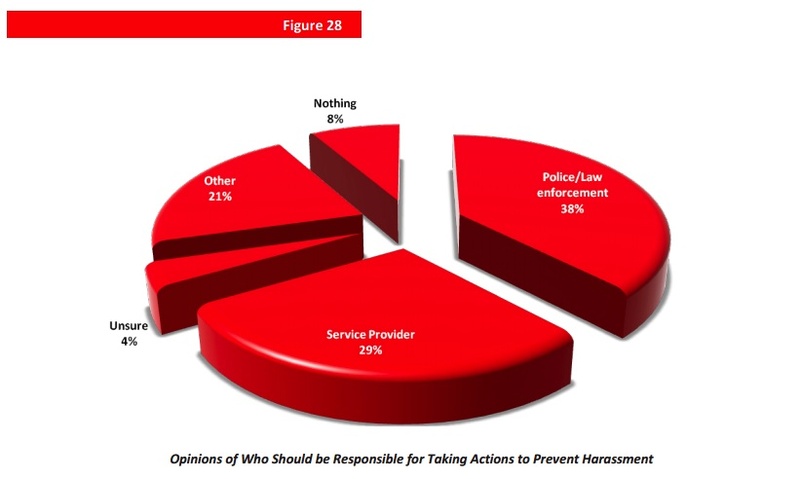 When asked who they think should be responsible for providing assistance in such cases, the most popular answer was that there should be some legal recourse (38%), whereas 29% of people thought that Service providers should provide assistance to help stop harassment. In terms of effectiveness, the most common to achieve beneficial results were changing of mobile phone numbers (31.9% successful), allowing an unofficial third party to intervene (31.6%) and reporting to an authority (30.2%). However, the fact that even the most consistently useful actions worked in less than a third of cases (and causing negative effects in other cases) reinforces the individual nature of each case and the danger of recommending one course of action in all cases. Of concern to the victim is not only assistance to stop the behaviours but also support to help deal with the psychological (and other) effects. 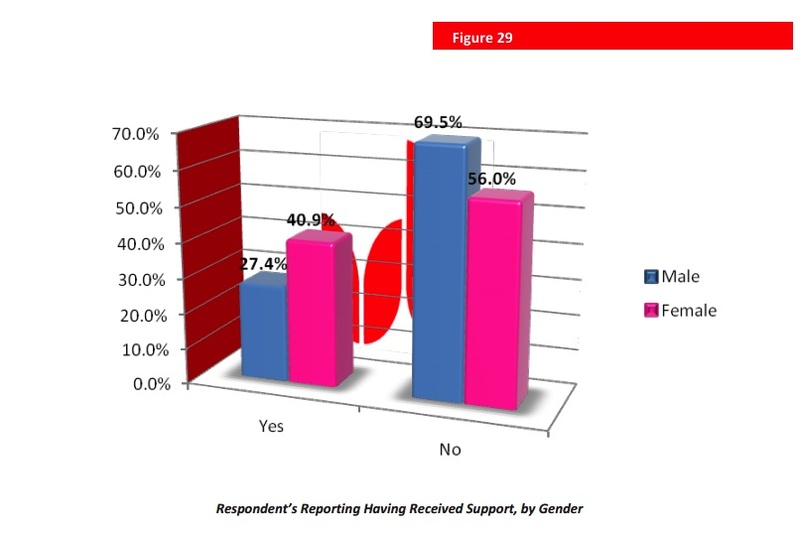 61% of victims (69.5% of females, 56% of males) reported that they received no support at all. The most common source of support was from friends and family (30.6%), with next most likely being the police service (12.4%) and other support organizations (11.6%). One of the aims of the ECHO project, as stated earlier in this report, is to more clearly define the “cyberstalking relationship“, namely to identify the specific communications technology-mediated actions performed by one party and directed at another, which may be interpreted as threatening, frightening, intrusive or otherwise unwelcome by that party; and also to identify the specific experiences of the 2nd party in response to the actions of the first party….”. The ECHO Pilot Survey has proved a key step towards that goal by collecting data that has provided significant insights into how people are being harassed, what effects it has on them and the ways in which they deal with it. For the first time, we have a picture of what cyberstalking means to victims in the UK. It may be tempting to dismiss cyberstalking and harassment as somehow less real than ‘traditional’ stalking methods. However, the effects on the victim can be very real. The psychological effects can be devastating, producing verifiable psychological trauma and damage, regardless of whether the victim ever actually meets their harasser. The data collected by the ECHO Pilot Survey help confirm this by indicating that victims of severe electronic harassment suffer from post-traumatic stress disorder. A key factor in the cases recorded by the pilot is the number of different ways victims were being harassed, with their antagonists using a variety of technological means to deliver the abuse. It is not just e-mails or phone calls or social networking sites, in the majority of cases it can be all of these and more. Harassers can use technology to invade multiple aspects of their victims lives, leave them feeling that they have no way to escape. The data shows that victims of multiple modes of harassment are more likely to experience more severe psychological impacts. The fears created by cyberharassment behaviours are varied and extreme, varying for the individual effected. The study has shown that there is a difference in the main fear provoked in men when compared to women. Males are more likely to having the harasser damage their reputation, whereas women are shown to be more likely to focus on fear of physical harm. The effects of the damage caused by cyberstalking are shown to affect multiple aspects of people’s lives, from their working lives to their relationships with others. Respondents reported changing/losing jobs, isolating themselves by giving up social activities, having their relationships break up. One clear message from the data collected is that many of the victims of cyber harassment are frustrated with the lack of help and support they feel is available. The key sources they want to be able to act are the Police and Service Providers, both in terms of providing actions that can stop on going harassment and also in providing support to those affected in dealing with its effects. This adds to the growing debate of whether legislative change is required to allow the police and encourage service providers to provide the help people need in cases of cyber harassment and if so, exactly what changes those should be. McFarlane et al. (1999) Stalking and Intimate Partner Femicide. Homicide Studies. Weathers, Litz, Huska, J.A & Keane, T.M. (1994) PTSD checklist-civilian Version. Boston: National Center for PTSD, Behavioral Science Division. Esta entrada fue publicada en Acoso, Análisis, Ciberacoso, Género, Violencia y etiquetada Acoso, ciberacoso, Crime, crimen, Cyberstalker, Cyberstalking, Stalking, United States, University of Bedfordshire por lasdisidentes. Guarda enlace permanente.